Smartphones are coming with amazing hardware specifications, making them capable of running graphics-intensive games. However, that doesn’t mean we should leave all the classics behind. There was a time when PSP (PlayStation Portable) was a big thing, but it got outshined by today’s Smartphones with solid specs. Fortunately, we don’t have to say goodbye to our favorite PSP games as we can also run them on Android phones. Using a dedicated emulator, you can easily run almost all types of PSP games on your Android phone, and in this tutorial, we are exactly going to show you play psp vita games on android. Note: The performance of the games depend on the hardware of your Android phone. Some games may work a bit slower, and some might not even work at all. Mid-range to high-end phones are recommended. There are many PSP emulators available on the Google Play Store, but not all of them are good. 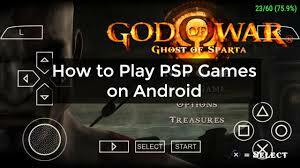 In this tutorial, we are going to use the PPSSPP emulator. It is an open-source app and ad supported on Android platform while being completely free. There is also a paid version that will only remove the ads (other features remain the same) and give you a golden icon. You can download PPSSPP from the Google Play Store as long as you have a device with Android version 2.3 and above. However, the app doesn’t come with any kind of PSP games, so you will have to add ISO image or .CSO file of your PSP game in your phone to load the game. pspgameess is using Hatena Blog. Would you like to try it too?